Nike Women sent me a pair of Nike LunarGlide+ 4. This is the latest running shoe from Nike which uses the Nike Flywire technology to provide a custom fit and its signature Lunarlon Dynamic Support system for stability and cushioning. 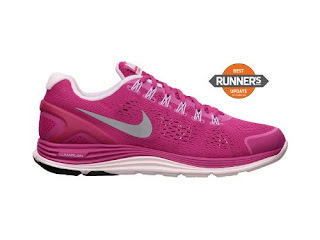 The Nike LunarGlide+ 4 won the Best Update in Runner’s World Fall 2012 Shoe guide. Basically each time my foot strikes the ground it feels like they are getting tiny hugs. It's a soft ride (imagine jogging on a path of march-mellows -minus the goo) the softness results in a bouncy run which feels like having a spring beneath the shoes and perfect for the beginner and elite runners. I’m still breaking them in, I've only had two runs with them, (both indoor and outdoor = 8mi) but I’m in love. The toe box is also just right. Not too tight. Not too roomy as well. Best of all, it's lightweight (at 8.2 oz) and help make my runs much easier and enjoyable. I'm loving my Lunar Glide 4's! Great review!